In the Actor Model, concurrency is the default. Sequencing must by arranged explicitly. An important case of sequencing occurs when there is a data dependency between different parts of a system. One part produces a value that another part needs to perform its function. One mechanism for sequencing data-dependent operations is to create a Future. This is sometimes known as a single-assignment data-flow variable (e.g. : in Mozart/Oz) . It is basically a storage cell that can be written to only once, but read from multiple times. If a read occurs before the write, the read-reply is delayed until the write provides a value. This effectively suspends readers until the write occurs. Note, however, that there is no blocking in an actor system. The asynchronous reply to a read request is simply deferred until a value is available. When an actor representing a Future is created, its value is unknown. In this state, it expects either a #read or a #write request. When an actor with future_beh receives a #write request, it becomes bound to the value and sends its SELF to the customer cust. This serves as a synchronization signal, indicating that the value has been set. When an actor with future_beh receives a #read request, it becomes waiting for the customer cust. Notice that there is no reply to the customer at this time. When a Future has been bound to a value, it expects only #read requests. Any other messages (including #write requests) are silently ignored. When an actor with value_beh receives a #read request, it simply sends its value to the customer cust. When a Future receives #read requests before a value is provided by a #write request, the deferred readers are buffered in the waiting actor. When an actor with wait_beh receives a #write request, it becomes bound to the value and sends its SELF to the customer cust. Now that a value is available, it creates a broadcast actor to send replies to all the waiting readers. When an actor with wait_beh receives a #read request, it adds the customer cust to the list of deferred readers. A Broadcast actor is created specifically to send a value to a list of customers. A Future uses a Broadcast actor to deliver replies to deferred readers. An actor with broadcast_beh is created with a value. When it receives a waiting list, it uses pattern matching to determine if the list is compound, or just a single value. If the list is compound (a pair), it sends the value to the first customer, and sends the rest of the waiting list back to itself. If the list is just a single value, it simply sends the value to the last customer. Once the value has been delivered to all the waiting customers, there will be no further references to the Broadcast actor, so it can be reclaimed by the garbage-collector. 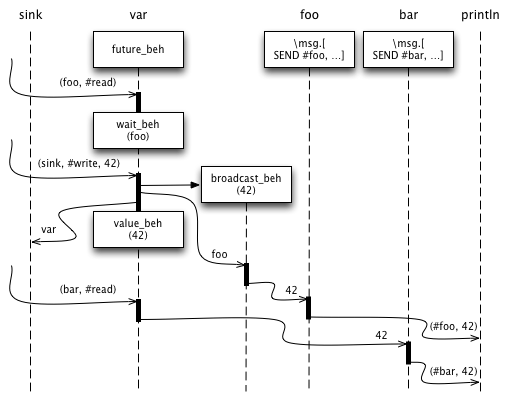 The following example demonstrates the operation of a Future receiving concurrent #read and #write requests. We create two customers, foo and bar, which simply label any message they receive and send it to the console (via println). These customers are used in two concurrent #read requests for the Future var. A concurrent #write request sets the value of the Future to 42. The customer for the #write request is sink (which ignores all messages) because, in this case, we don’t care about when the value is set. Since the #read and #write requests are issued concurrently, the Future var will receive them in a non-deterministic order. The #write request could arrive first, in which case the #read requests will be satisfied immediately. The #read requests could both arrive before the #write, in which case the read-replies will be deferred until the value is set by #write. Or, the #write request could arrive between the two #read requests, as shown in Figure 1. Access to a Future, as described above, implies the capability  to #read or #write its value. In many cases we would like to separate those capabilities. We may want to give read-only access to several potential consumers, while reserving write access for the producer. One powerful feature of pure-actor systems is that Actors act as security capabilities. In order to attenuate the capability of a client, we simply create a proxy actor that enforces our desired security policy. An actor with read_only_beh is created with a reference to a future. When a #read request is received, the message is forwarded to the future. All other messages are silently ignored. Similarly, we might want to create a proxy that provides only write capability. This is slightly more complicated due to the write synchronization signal. The Future responds to a #write request by sending its SELF back to the customer. Our proxy must intercept this response and substitute its own identity to maintain encapsulation of the future. When an actor with write_only_beh receives a #write request, it sends a #write request to the future, providing a customer k_write with write_sync_beh. When the future responds, k_write sends the identity of the proxy to the original customer cust. Sometimes it is useful to arrange a race among multiple producers. You may have multiple algorithms competing to provide a result. Different algorithms may win under different circumstances. The first one to determine a result will #write to the Future. Subsequent results are ignored. In this case, the write synchronization signal is unimportant, so we change the protocol to expect a #result message with no customer. This behavior acts like an adapter between the racers (sending #result messages, expecting no reply) and the future (expecting #write requests and sending a synchronization reply). When an actor with result_race_beh receives a #result message, it sends a #write request to the future with the result value and its SELF as the customer. Then it becomes a behavior that ignores all subsequent messages. Note that this serves two purposes; to ignore any other race results, and to throw away the write synchronization signal. Futures are a fundamental synchronization mechanism in concurrent systems. We have shown how futures work through an actor-based description, illustrating the events that transition a Future through its life-cycle. Building on that foundation, we have demonstrated how, following the Object Capability Model, we can exercise fine-grained control over access to the Future. This is extended to the case of arranging a race among concurrent speculative computations. J. Dennis, E. Van Horn. Programming Semantics for Multiprogrammed Computations. ACM Conference on Programming Languages and Pragmatics, San Dimas, CA, August, 1965. This entry was posted in Uncategorized and tagged actor, adapter, asynchronous, blocking, capability, concurrency, data-flow, deadlock, dependency, future, promise, protocol, proxy, security, sequence, synchronization, value. Bookmark the permalink. Post a comment or leave a trackback: Trackback URL. BECOME broadcast_beh(rest)  // "tail recursive cycle"
Perhaps I have an explanation: this erlang style “tail recursive cycle” may last long, the waiting list can have thousands and thousands of members. Actors are only supposed to do small pieces of computation at any time, kinda “atomical shots” of CPU bursts between comparably much longer IO waits. With BECOME, this actor gets blocked, ie. it can’t serve messages any longer. The problem with this explanation is: who cares, we don’t want to do anything with this particular actor. Ok, if the implementation is some kinda cooperative multitasking, a cycling actor can block the whole program, but I feel the real (conceptual) target machine of a language like this should have millions of (rather cheap and not particularly smart) CPUs with lots and lots of some serial type of interconnections. So no one gets hurt if broadcast_beh blocks a single CPU. Oops, now I understand… There’s no “tail recursion” in Humus, the BECOME starts a new listening cycle. In erlang, you have to do explicit tail recursion, otherwise the process exits. Apparently, in Humus, it is up to the garbage collector.